CrossFit’s Hero WODs are challenging tests of fortitude—but they also represent something greater. Russell Berger takes a closer look at workouts created to honor our fallen. On June 28, 2005, four Navy SEALs on a reconnaissance mission in the Kunar province of Afghanistan were ambushed by an overwhelming Taliban force. Team leader Lt. Michael Murphy, unable to call for help from his location, walked into the center of enemy fire, where his satellite phone might work. He punched in the numbers to HQ and calmly requested reinforcements. Even after being knocked to his knees from a gunshot wound to his back, Murphy calmly sat back up, steadied himself and continued the call, knowing that it was the only way he might save his men. Once the call for reinforcements had been completed, he returned to the fight. Sadly, Murphy and all but one of his men were mortally wounded after a failed rescue attempt. Murphy was posthumously awarded the Congressional Medal of Honor for his actions that day. Among those killed in the rescue attempt were Petty officer 1st Class Jeff Taylor and Lt. Michael McGreevy. Both SEALs were posthumously awarded Bronze Stars for Valor and Purple Hearts. These men were fathers, husbands and sons. They were brothers to their fellow SEALs. They were also CrossFitters. In their actions, these men embodied the values and spirit of true heroes, and to immortalize their courage, bravery and self-sacrifice, the CrossFit Hero workouts were created. Excellent article. Is there any way Main Site could add more detail to the Hero WOD postings? I never knew that level of detail surrounding Murph's death. As a former Army captain turned police officer I dread seeing new Hero WODs but I know these men died doing something they believed in body & soul. I ask all who undergo any Hero WOD to attack it like your life depends on it. Show these brave men their sacrifice matters! 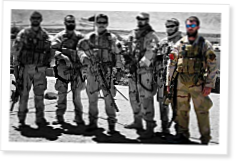 Here is the link to "Lone Survivor." This is the book written by the one surviving SEAL from Murph's unit. HQ, thanks for the article. HEROES, thank you for your service. For anyone out there who hasn't read Lone Survivor, Buy it, and Read it. It's far and away the best book I've ever read. Those dudes are BMF'ers, all of em. Thanks for the great article. What CrossFit HQ did for us at Fort Hood was unbelievable and truly made a difference for those affected. A lot of people at CF HQ worked very hard under tight time constraints to pull that memorial WOD off and they did it to honor fallen Soldiers. It's impossible to express how much that means to us. It's inspirational being deployed and watching people here hit the Hero WODs - they are very serious events and people kill themselves over here executing them. For a great many of us, the only thing between being here now and having a Hero WOD named for us has been some luck. It's a seemingly simple thing that means a great to us servicementbers. Russell - thanks for such an outstanding piece of work. The LUMBERJACKS are doing well in southern Afghanistan, we appreciate all that the CrossFit community does for those who serve and especially for those who have paid the last full measure. The article lists Michael Murphy as a First Lieutenant, but there is no such rank in the US Navy. He was a Lieutenant/0-3. Aye, Russell. Well done and well written. Thank you for this Memorial Day gift. Great article, Russell. Thanks for capturing the spirit of service, honor, sacrifice and memories in a well written article. To learn more about Michael Murphy, I highly suggest the new book by Gary Williams, "Seal of Honor". Thank you for your sacrifice Michael. For Memorial Day I combined Murph, JT & Michael into one mega-workout "Lone Survivor". I used Brand X scaledowns for Murph(kept the mile runs) & JT and kept Michael as Rx'd as it's the one of the few Hero WOD's I can do. 1:38:50 (49:42/17:00/24:52) lots of broken sets and recovery and treadmill runs. I've ducked Murph in the past but it's Memorial Day. My best friend ran a 5k in his Pat Tillman jersey so I toyed with the idea of doing the Tillman WOD from CF Football but so many people checked out Lone Survivor from my Library the idea fell into place. Thank you to those that keep us free! "Never shall I fail my comrades. I will always keep myself mentally alert, physcially strong and morally straight and I will should more than my share of the task whatever it may be, one-hundred-percent and then some." Thanks for capturing the real meaning of Memorial day. It certainly is not a car sale or mattress giveaway event! Good dudes doing bad things to bad people. I second this. Not a big fan of reading, but I made it through this book in 3 days because I simply could not put it down. True hero's. I have read "Lone Survivor". I had a hard time putting the book down. The story was unbeliveable. I highly recommend this book. There's bit of Biblical wisdom in how CF honors our fallen. In the temple, Jesus points to an old lady and informs all present that she has given more that day than any other - thought she gave but a pittance - because she brought a larger portion of what she had to offer than any other contributor. In other words, give what you have to offer, that will be enough. What CF has to offer to these fallen in a 'spiritual' sense is a hero WOD. That said, CF and its founders have offered the Hero WODs and now much more towards our nation's fallen, through Op Phoenix, the Lumberjack WOD, Trevor Win E, and FGB, and my guess is those are just for starters. The PDF says the MOH was awarded in 2005. The award wasn't given until around 2007. The date of action was 2005. They just named an Arleigh Burke-class destroyer after this remarkable hero. His mother christened it and wished him a Happy Birthday on what would have been his 35th.